Toronto J-Film Pow-Wow: Ken Takakura joins all star cast and reunites with "Poppoya" director for new film "Anata e"
Ken Takakura joins all star cast and reunites with "Poppoya" director for new film "Anata e"
Sadly there are few Japanese screen legends still with us these days. There are a few who still appear on stage and screen -- Tatsuya Nakadai, Rentaro Mikuni, Tetsuya Watari -- but few have the sheer star power as Ken Takakura. The star of such films as "The Man from Abashiri Prison", "Poppoya: The Railroad Man", umpteenth Toei yakuza films throughout the 1960's, as well as a handful of American crossover films (Paul Schrader's "The Yakuza", Ridley Scott's "Black Rain"), Takaura has been immortalized as a charismatic hero of Japan's post-war boom. Now the 80-year-old actor will be returning to the big screen, heading up an all star cast in a new film by "Poppoya" director Yasuo Furuhata. 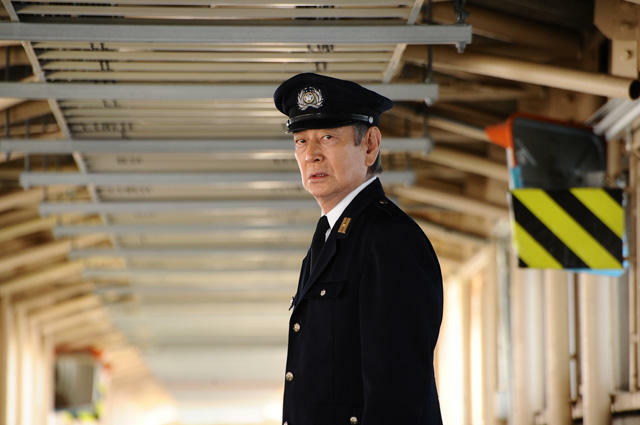 Titled "Anata e", this new film will see Takakura portraying a prison guidance officer who hits the road to take the ashes of his late wife (Yuko Tanaka) to her home town in Kyushu. Along the way Takaura's officer crosses paths with Tsuyoshi Kusanagi and Koichi Sato as a pair of squid vendors, Kimiko Yo and Haruka Ayase as a mother and daughter who run a restaurant, Takeshi Kitano as a middle school teacher, as well as characters played by Mieko Harada and Tadanobu Asano, amongst others. A legendary actor backed up by some of the biggest names in Japanese film? Sounds like a real treat to us, but we'll have to wait until the fall of 2012 to see how Yasuo Furuhata's "Anata e" turns out. Thanks to Tokyograph for this great piece of news, and Eiga.com for the above promotional still of Takakura in character.